APAARI, the Council of Agriculture (COA), Chinese Taipei (Taiwan); the World Vegetable Center (AVRDC), Taiwan; Australian Centre for International Agricultural Research (ACIAR), Australia, and Asian Farmers Association (AFA), the Philippines, will be organizing an Expert Consultation on Successful Agri-Food Innovations in Asia and the Pacific. The event will take place in Taichung City, Chinese Taipei on 1-3 November 2016. The APAARI General Assembly Meeting (GAM) will also be held at the same venue in the afternoon of 3 November 2016. The focus of the Expert Consultation will be on identification of successful agri-food innovations and will look at their potential for up-scaling and out-scaling for the benefit and wellbeing of smallholder producers and rural communities in the Asia-Pacific region. Being based on and/or developed around a central concept/ideaand principles of intervention/change, which could be technical, policy, institutional or partnership related in the context of agri-food development. Willing participation of relevant actors, partners and organizations in various processes and stages of agri-food innovations, leading to economic, social and environmental benefits and overall sustainability. Being pragmatic, effective and self-adjusting arrangement of participation, actions and interactions towards positive and sustainable development for the benefit of all partners involved. Generating positive benefits to women, youth and marginalized and disadvantaged groups of the society. Having proven potential to be up-scaled and out-scaled to bring impact at scale for wider benefits. The APAARI community possesses strong expertise and experiences in promoting successful agri-food innovations that could be shared at the Expert Consultation. 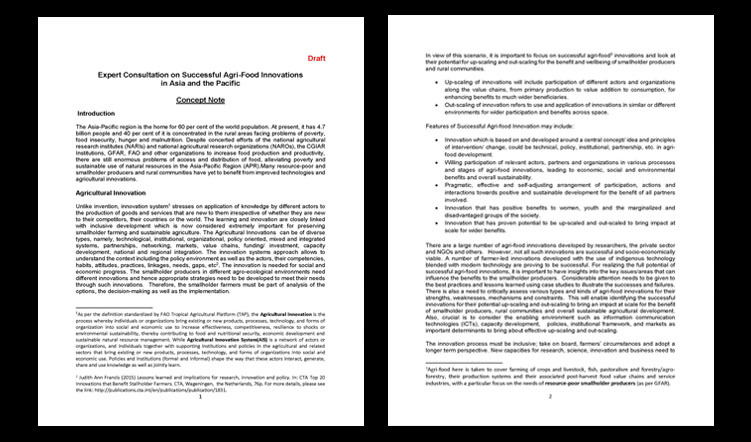 The Association, therefore, invites its members and partners to send a one page outline of the most successful agri-food innovation, having the potential to be out-scaled and up-scaled for the benefit of smallholders in similar or different environments. 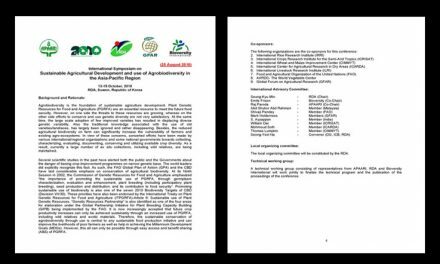 This information will help APAARI in identification and selection of the most promising, successful, and impact-oriented agri-food innovations, which can be shared with other participants in the Expert Consultation. Those that will not be selected for presentations based on APAARI criteria will have other opportunities to share their innovations through display of posters based on merit. Some examples of successful innovations that APAARI is looking for can be found here. Those who are interested in sending their contributions may do so by 31 May 2016. The contribution may please be sent to Dr Bhag Mal, Senior Consultant (b.mal@apaari.org) with cc to Dr Raghunath Ghodake, Executive Secretary (raghunath.ghodake@apaari.org) and Mr. Vishwanath Sah, Administrative Associate (vk.sah@apaari.org).